League Certified Instructor and former Bicycle Coalition board member Ed Hein will be hosting a Biking 101 class on Monday June 28th from 6:30-8:30 at the Ambler Area YMCA on M0nday June 2. The two hour course will provide cyclists with the information that they need to ride safely and legally in traffic or on the trail. The course covers bicycle safety checks, fixing a flat, group riding and on-bike skills to avoid crashes. 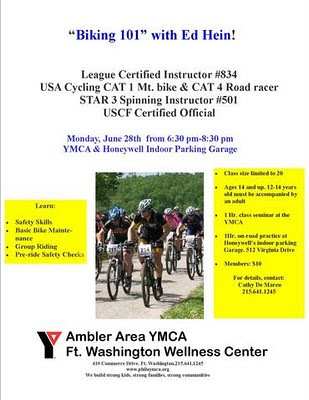 The course is only $10 YMCA members and higher for non-members.